Wynsome Peters holds a B.A. in Interdisciplinary Studies. Currently, she resides in San Antonio, Texas surrounded by family and a cat who doesn’t know his name. Unlikely is her debut novel. When Nate discovers that there are people trying to steal ideas from the company where his dad is employed, he jumps at the chance to uncover them. Yes, he doesn’t have any detective experience and yes, they are criminals (per se) and might be dangerous; he can handle it. Won’t his dad be impressed when he grabs the perps unless the perps nab him first. He faces more to lose than just dignity. He has put himself plus his best friend Zachary, who got dragged into this in a dangerous situation. The outcome may not be what either of them want. About L.S. Davis: Growing up, I had absolutely no appetite for food. 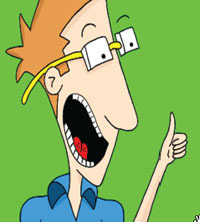 I only had an appetite for doodling cartoons. Now I am the proud father of a precious little girl who has the absolute biggest appetite for all foods. Watching her and the many different ways she enjoys her food inspired me to do this story. 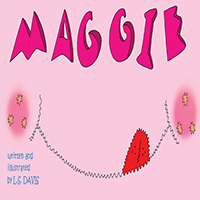 Maggie is a little girl with a very big appetite. Follow her as she gobbles her way through many different foods in many different ways . . .
Julie Bettendorf is a world traveler, with a background in history and a degree in archaeology. Through her books, she shares the wonderful world of travel with children and their parents as Anthony Ant teaches kids about other cultures, customs, and traditions. When Julie is not traveling with her children, she lives in Central Oregon. Hi, my name is Anthony Ant, and I love to go places. When I travel, I can fit into some pretty small spaces. Once I curled up in a suitcase, as snug as could be. When I came out, I was in beautiful France. Whoopee! These are the tales of Anthony Ant, a child’s travel companion and all-around great adventurer. Anthony travels in style, comfortably lodged in a suitcase, and he never knows what strange, new country he will find himself in. 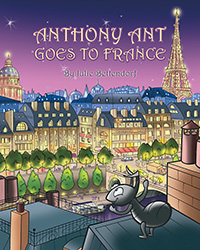 In Anthony Ant Goes to France, he travels to Paris, where he meets Lulu Ladybug. Together they explore the food, culture, and sights of the city. Anthony visits the Eiffel Tower and Notre Dame Cathedral, eats French pastry, and gets to know the French people, all with his new friend Lulu. Nora Beason lives on 36 beautiful acres outside of Harrisonville, Missouri with her husband Don, her grandson Egan, and her Jack Russell, Buddy. Nora has always enjoyed writing poems and short stories, and in August 2013, decided to write her first novel, with the encouragement of her family and her faith in the Lord. Lily, Daisy, and Rose Wind were well mannered, well educated young ladies in 1874. Lily was 14, Daisy was 12, and the curly little redhead Rose, was 10. Suddenly their world came to an end when their parents died from a small pox epidemic. Daisy and Rose were put on an orphan train heading west. During the confusion at the crowded train station, Willy the Kid and Daisy had to crawl out of a tiny window to escape the law, and the train left without Daisy. Rose was alone on a train of unfamiliar faces. For seven years Daisy prayed that she would find her sisters again. Her whole world existed around 4 little cabins surrounded by mountains in the middle of nowhere in a deserted outlaw town called Hideaway, New Mexico. Willy taught Daisy to shoot and ride and Daisy taught the children and families in Hideaway about the Lord. She became the school teacher and the Bible preacher, and learned to love and respect her new families. At the age of nineteen, Daisy Wind knew she had to leave Hideaway, and take the long rough wagon ride to Silver City, New Mexico in search of Luke and Willy. She was in love with Luke, and his blue eyes, so she left her safe haven in Hideaway, and followed her heart to Silver City. She thought the Lord had sent her to this gambling town in search of Luke, but she discovered the real reason why the Lord sent her there, and her life would never be the same again. Through sickness and through health, Daisy followed her heart.